Somehow he managed to do this, and so on the day I was returning to London, I had the rare opportunity to eat at two top restaurants in one meal, without leaving the building as both restaurants were housed in the top Four Seasons Hotel in Hong Kong. 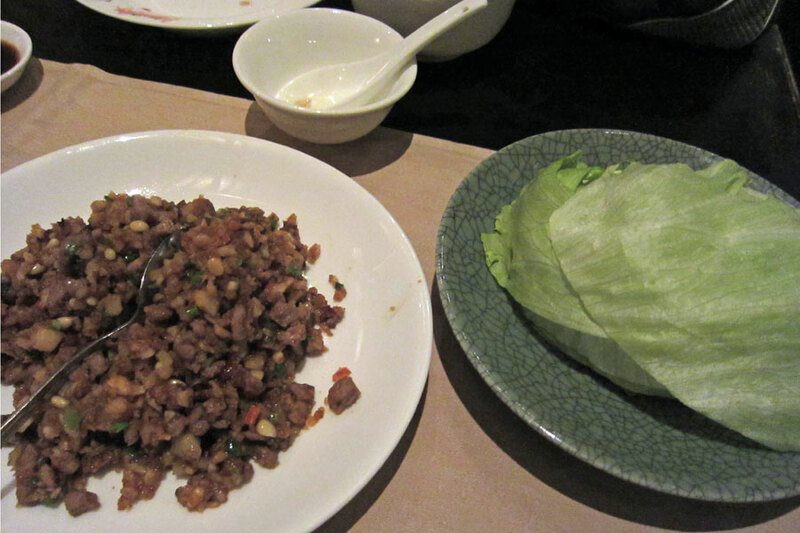 I met up with Raymond and his wife Judy at Lung King Heen, where we started the first part of the lunch with dim sum. 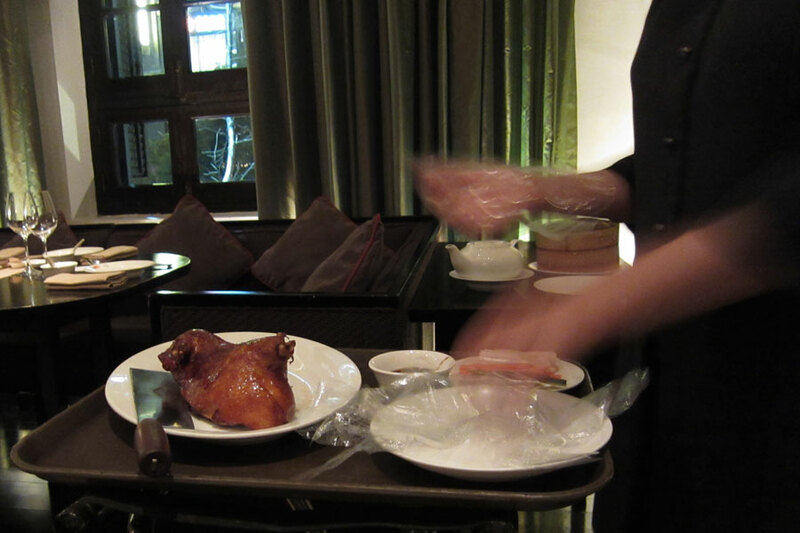 This was the first Hong Kong Chinese restaurant to be awarded 3 Michelin stars. It had an absolutely unbeatable view of the Hong Kong harbour. 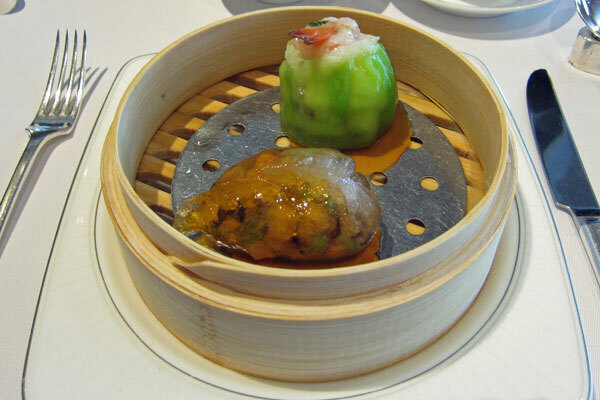 The first two steamed dim sum dumplings were steamed shrimp dumpling with morel mushroom, and steamed lobster and scallop dumpling. 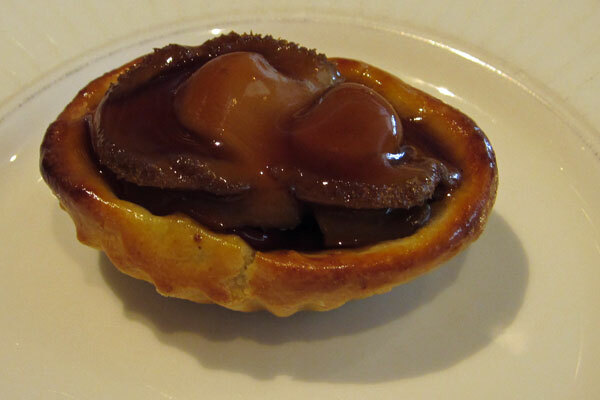 Both were exquisite and stuffed with a generous amount of ingredients that tasted pretty nice. 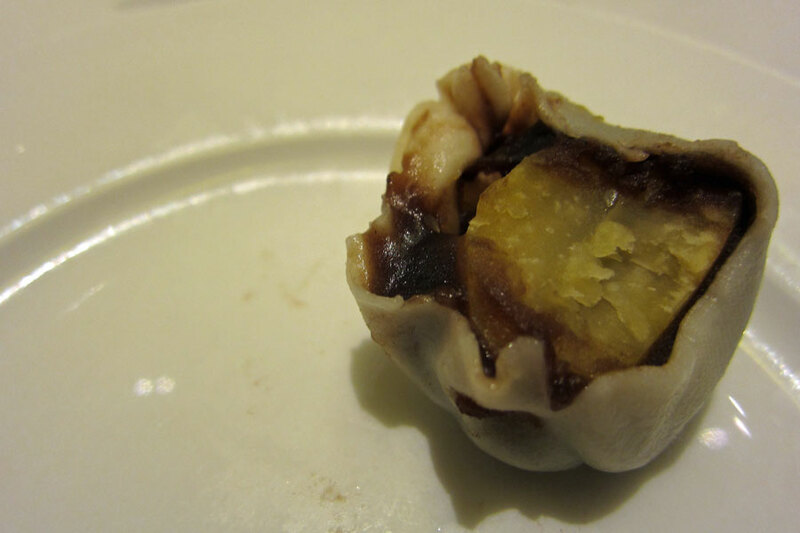 The next dim sum was baked whole abalone puff with diced chicken – the abalone was tender enough and topped with a rich glaze. And extra marks for not having soggy pastry. 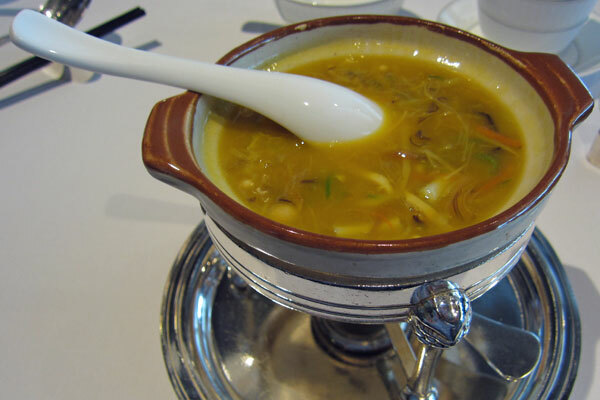 We then sampled the soup, which was superior chicken broth with shredded chicken – it was very rich in chicken flavour. 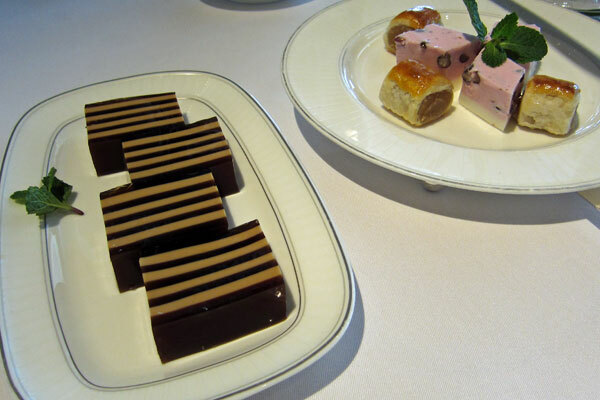 Before we left the first three Michelin stars behind, we tried the chilled coffee pudding layers – it was a twist to the traditional layered coconut pudding, with the use of coffee. It looked more interesting than it tasted – somehow I did not think that the coffee worked well in this. 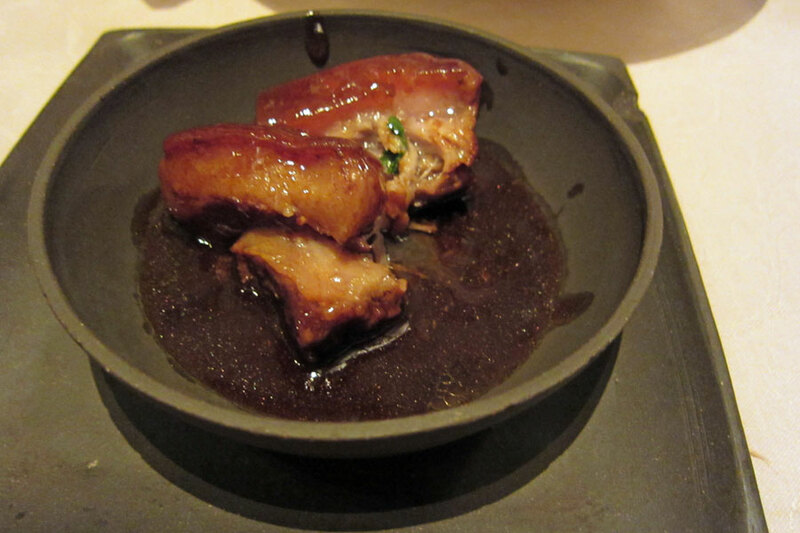 By this point I was nearly full, but we had to go up two floors to Caprice – the other three-Michelin-starred restaurant in the hotel. 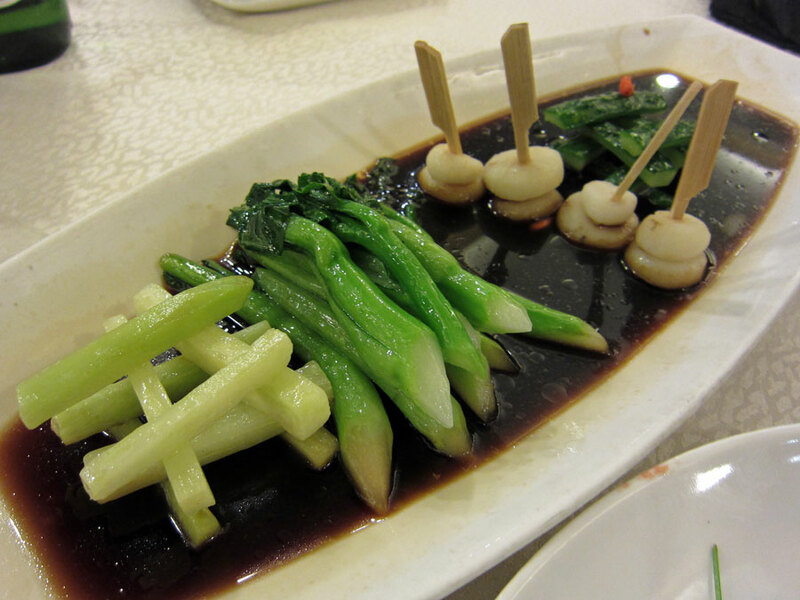 I was not prepared to have a full-blown three-course meal, so I asked the restaurant manager to recommend his favourite dish. 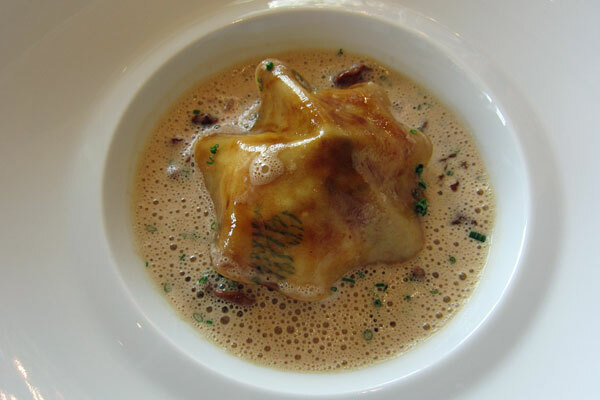 He said that the langoustine ravioli with veal sweetbreads and wild mushrooms in shellfish bisque emulsion. It was rich in flavour but the langoustine was on the slightly chewy side. 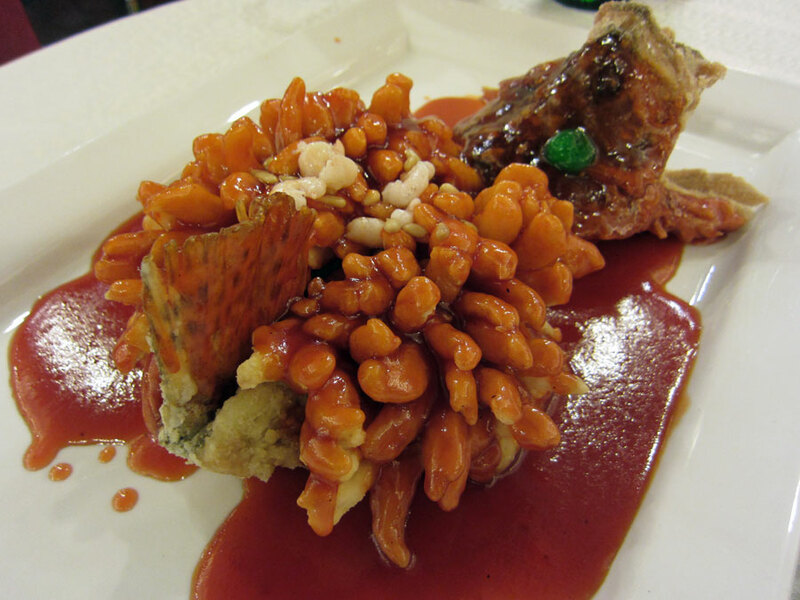 The dish was well-executed but lacked any form of excitement. 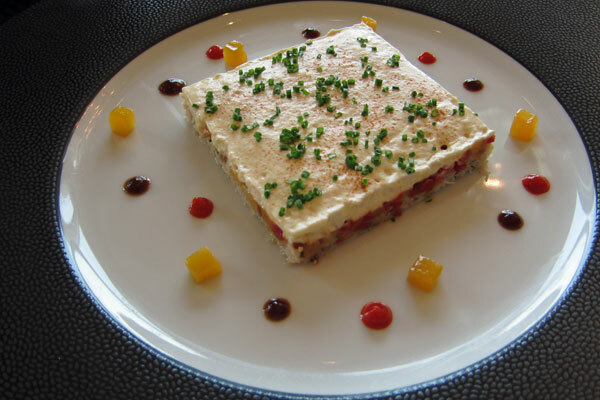 My cousin Judy had Tourteau crab tiramisu with fruity marinade and tandoori spices – the dish looked colourful and playful, and it was very refreshing with the various ingredients. Contrasted with the rich langoustine ravioli which would be more suited to the cold weather, this dish was more in line with the hot weather and the stuffiness of the city of Hong Kong. 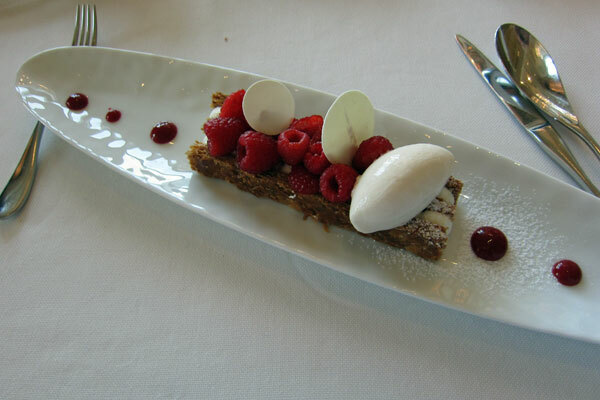 I wasn’t going to have a dessert but Judy and Raymond insisted that I tried the Napolean cake, which was millefeuilles with raspberries. Again while there’s nothing fundamentally wrong with it, there was nothing memorable. I found the noise level at Caprice a bit too much for a restaurant of this calibre – whether it’s due to the open-kitchen design or the rushing around of the staff (apparently because of the hectic life in Hong Kong, there’s a rule at Caprice that they must be able to serve a 3-course lunch in an hour to allow the customers to get back to work, though there’s nothing stopping you having a slow lunch). And if you would have thought that this would be the end of a crazy lunch. No! Raymond then decided that he wanted to show me the next hottest spot in Hong Kong, so he took me to a new Japanese restaurant called Sushi Ta-Ke in Causeway Bay. 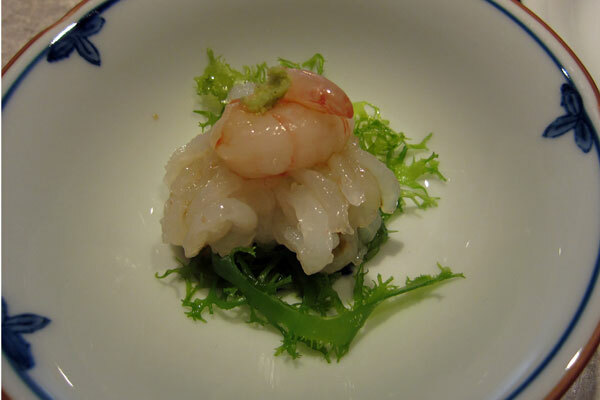 The restaurant was a collaboration with the famous sushi chef Sugiyama in Tokyo, and the raw fish was flown from Japan daily. 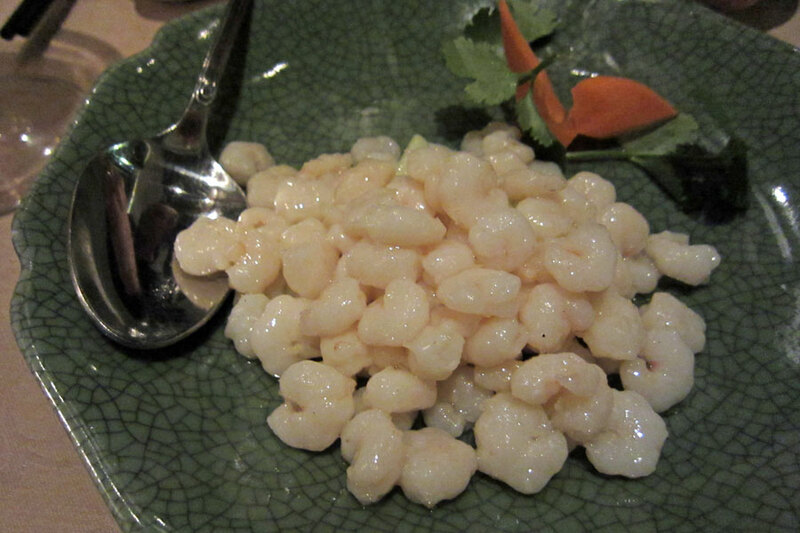 We tried a few dishes, including sweet shrimp, sea urchin, clam, tuna tendon – all very fresh and tasty. 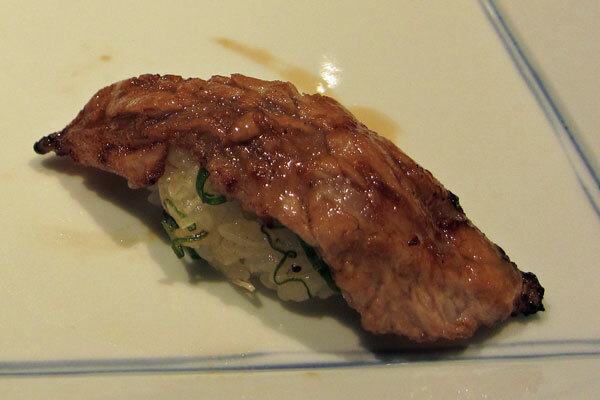 While we were just going to have a little bit of sushi to sample, Raymond once again insisted that I needed to try the Wagyu beef. It was tender and tasty enough. By the time we finished this third restaurant at lunchtime, it was already past 3pm. I had to go for a stroll to walk off some of the food, before heading back to the hotel to collect my luggage and then headed to the IFC mall in Central for dinner at 7pm. 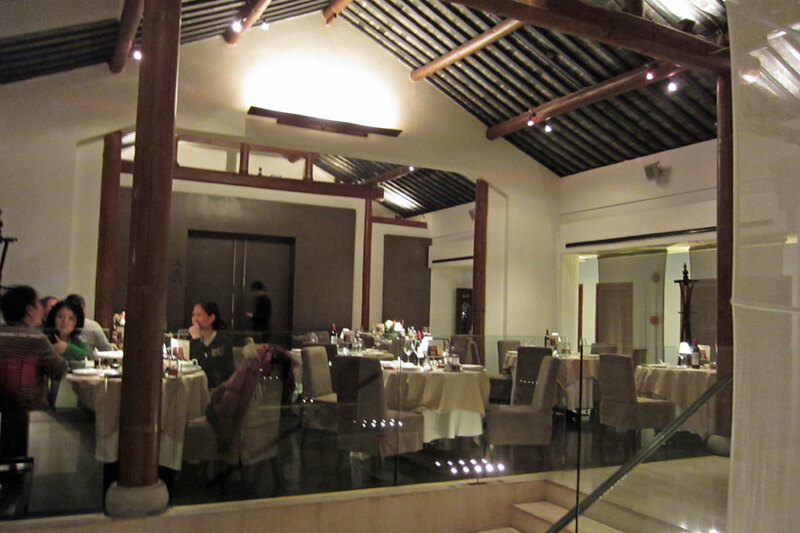 It was at the one-Michelin-starred Lei Garden. The restaurant was busy and somewhat disorganised – in fact to the point where I was wondering how it managed even a single Michelin star? 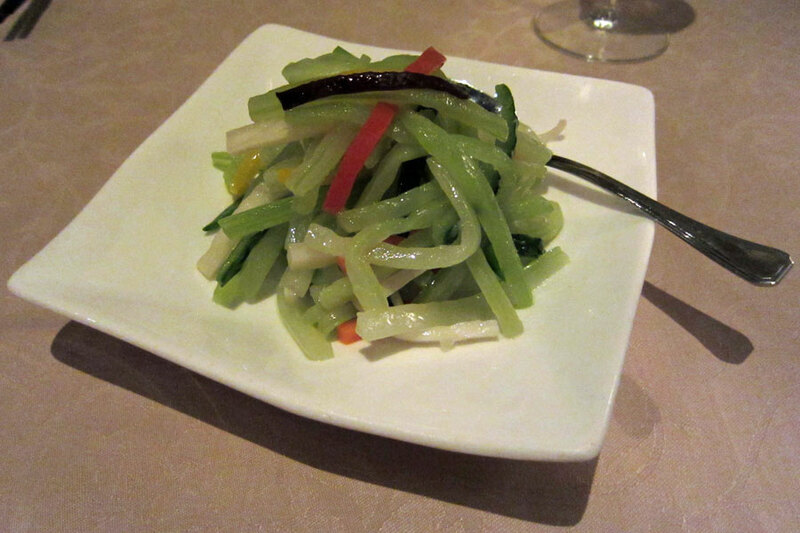 The service was chaotic: there was a steamed aubergine dish that obviously dried up before the aubergine was even cooked (we complained, and we got a much improved replacement); and then we asked for some rice at least three times and still none appeared. Avoid. 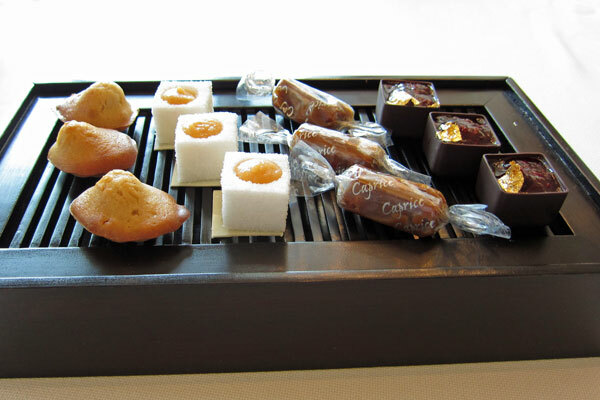 So it was either 6 Michelin stars in one lunchtime meal, or 7 Michelin stars in one day…. Either way, it was a fun thing to do though I would not have wanted to do it again, especially just before a 13-hour long-haul flight to London. One definite advantage was that I did not have to suffer any in-flight meals. Would I go back to the restaurants? 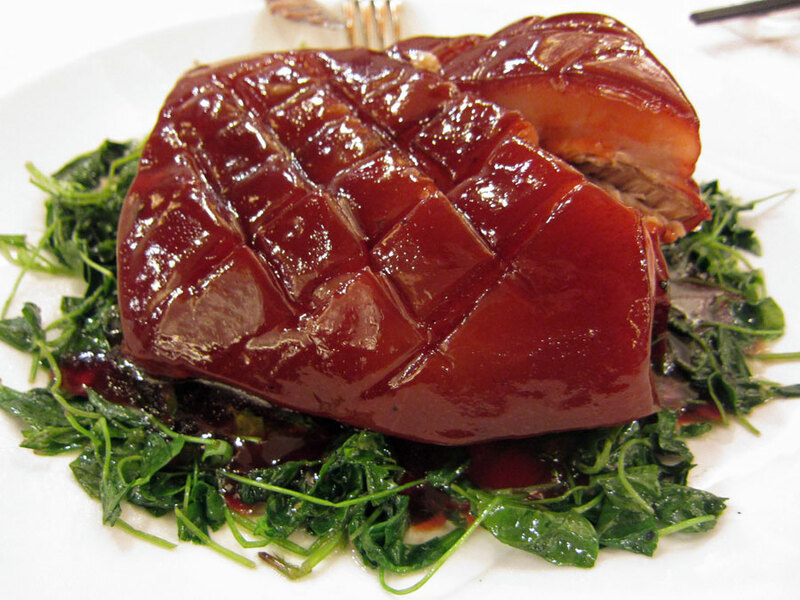 Well, I would go back to Lung King Heen – whether the three stars are equivalent to ones in the Western world is debatable. For Caprice, there’s no reason for me to go back. 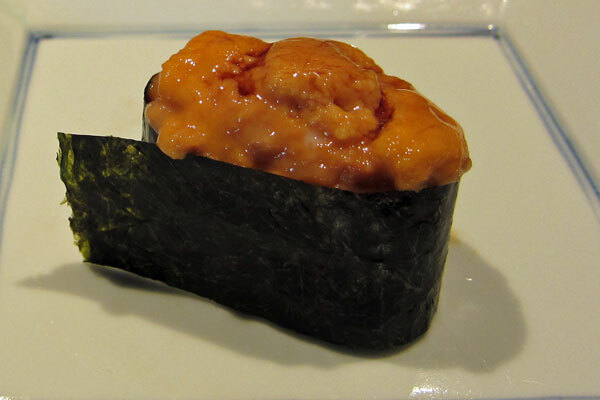 Sushi Ta-Ke would be interesting to go back for a proper meal and sample their cooked dishes. 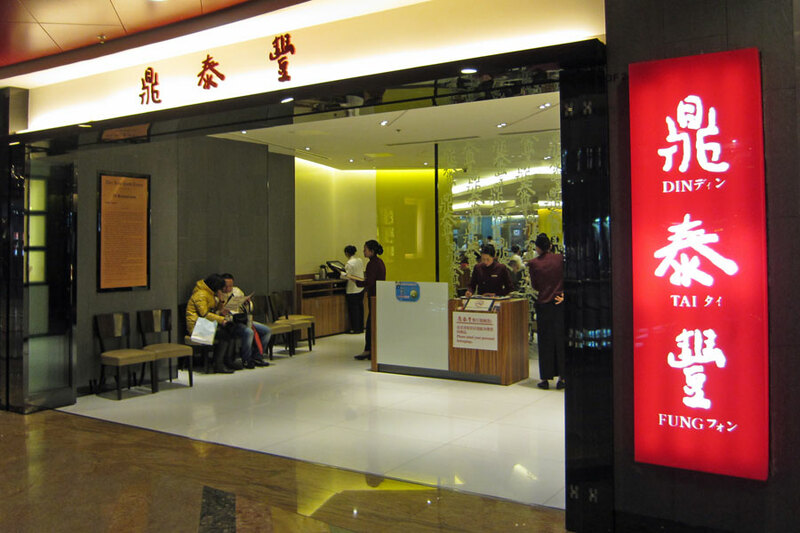 As for Lei Garden, they won’t see me again which is a shame as it’s so convenient for the airport express train and it could have easily become a restaurant to serve my pre-flight dinner in Hong Kong! 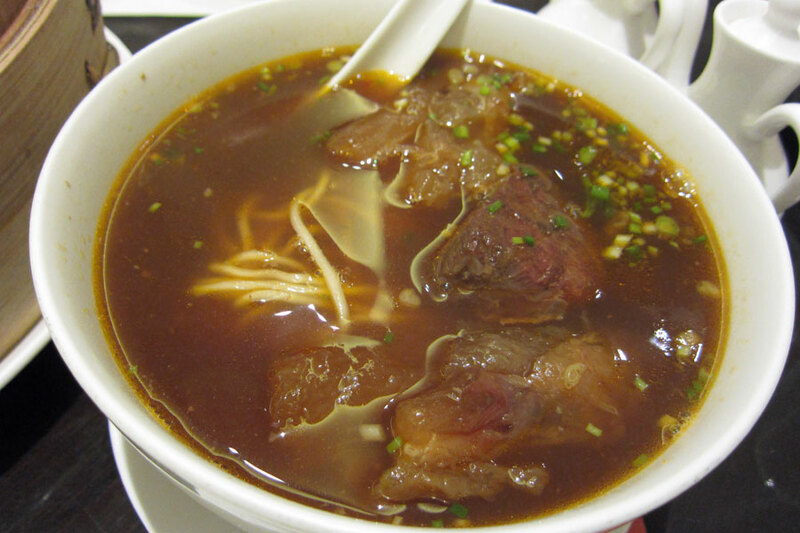 Away from the busy streets in Hong Kong, this restaurant is located up the hill from Sheung Wan, in the quiet street of Kau U Fong, and boasts the use of the finest ingredients and the absence of artificial stuff such as baking soda for tenderising the beef and MSG for enhancing the flavours. It had only opened for less than 6 months when I visited in January 2010 and the tables were already being booked up a few weeks in advance. 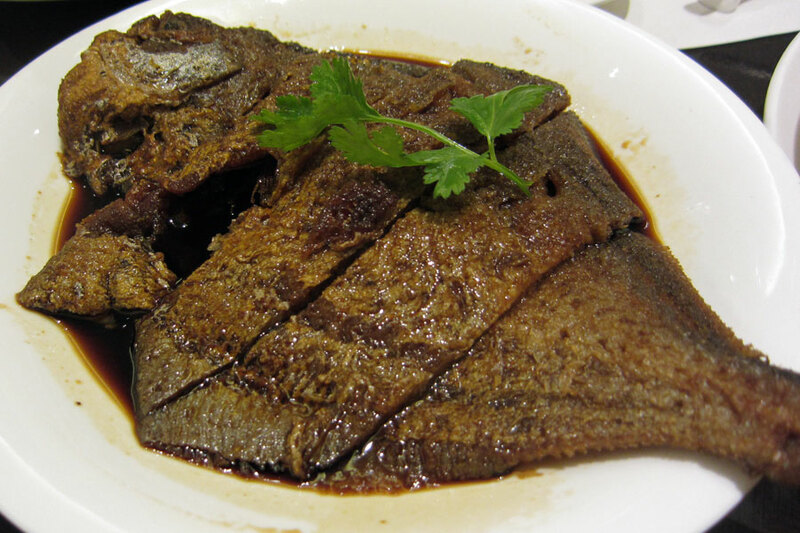 One of the signature dishes was Crispy Small Yellow Croaker served with Balsamic Dressing. If I remembered correctly, the fish as soaked in olive oil for a substantial amount of time, in order to soften the bone, so that the whole fish, including the bones, could be eaten. Was it really that special? I didn’t think so. If anything, it’s a very fiddly dish – some of the bones were just not crispy or soft enough to eat, and some of the sharp bones were just too dangerous to swallow. 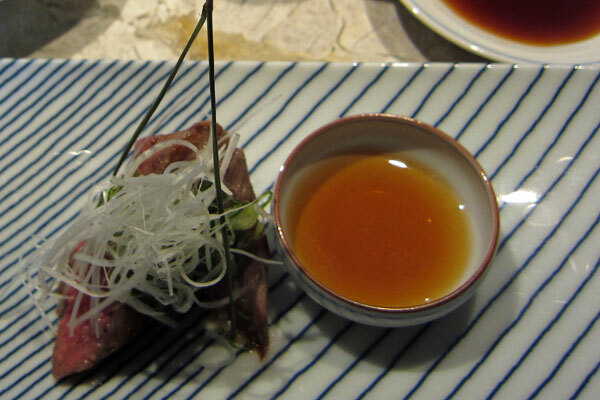 The Smoked Pigeon with Longjing Tea & Chrysanthemum was OK. The meat was moist enough but I expected a slightly richer flavour of the tea in the meat – I could have done a better version at home. 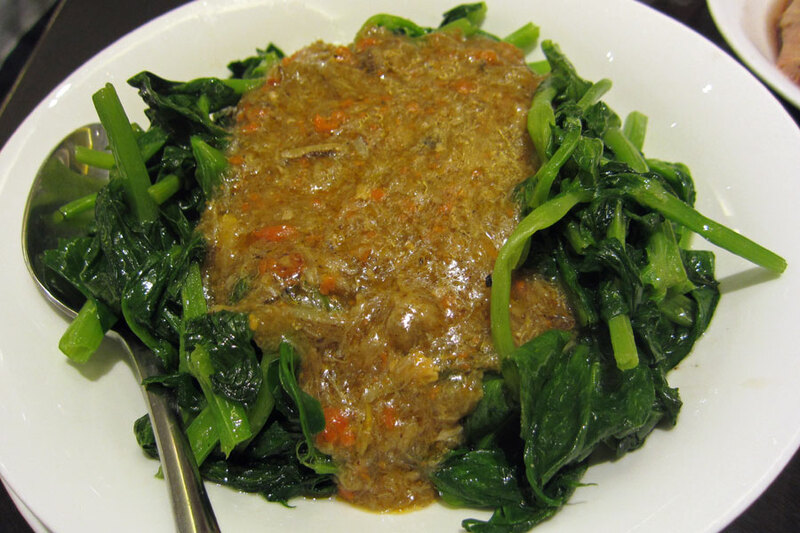 The Pan-fried Minced Pork Cake with Salted Fish tasted better than it looks – even though I wasnot a fan of salted fish, I could eat a whole piece of the minced pork cake. 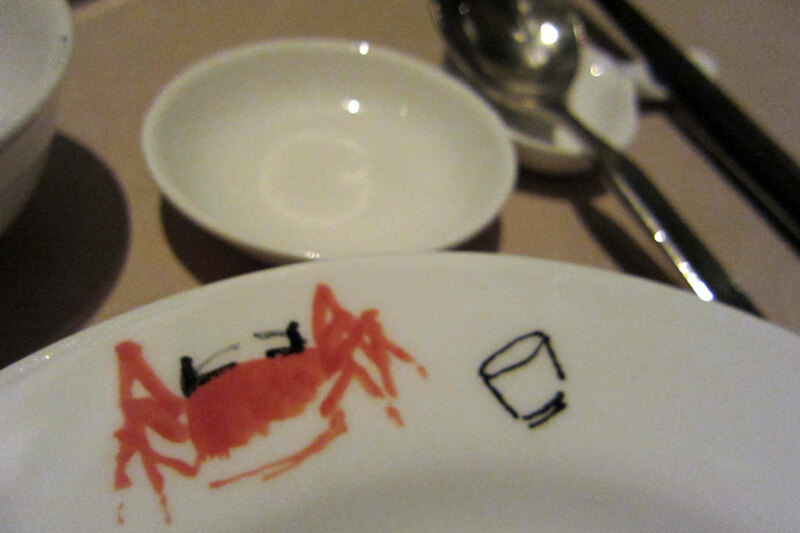 As for the main courses: Steamed Fresh Flowery Crab with Aged ShaoXing Wine & Fragrant Chicken Oil was disappointing – While the crabs were fresh enough, but again the flavour is lacking somewhat. 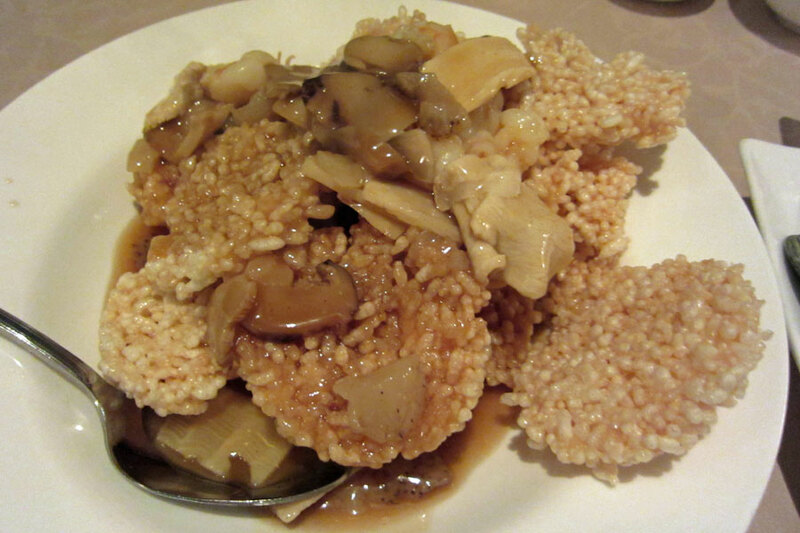 The soy sauce chicken was the usual standard – the restaurant claimed to have used the top quality soy sauce for making this, but did the higher price justify that improvement (or lack of improvement) in flavour? 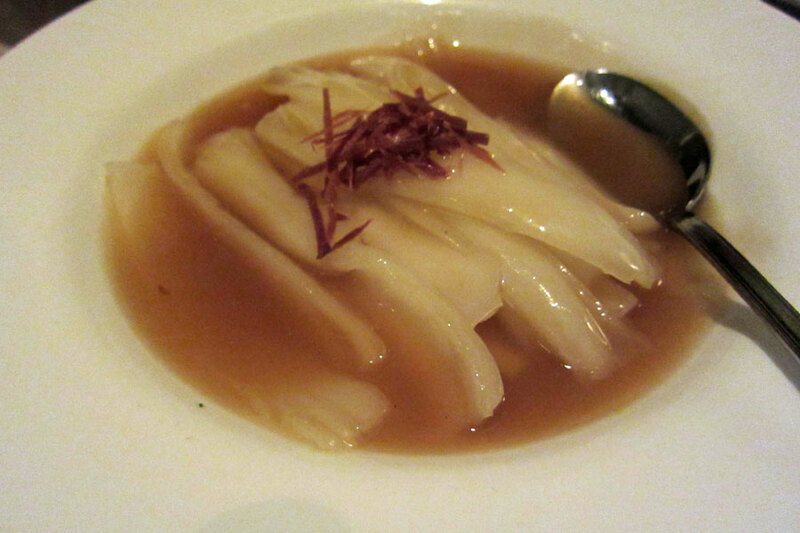 The Braised Layered Beancurd with Morel & Chinese Mushrooms was probably the nicest main dish out of the whole lot. 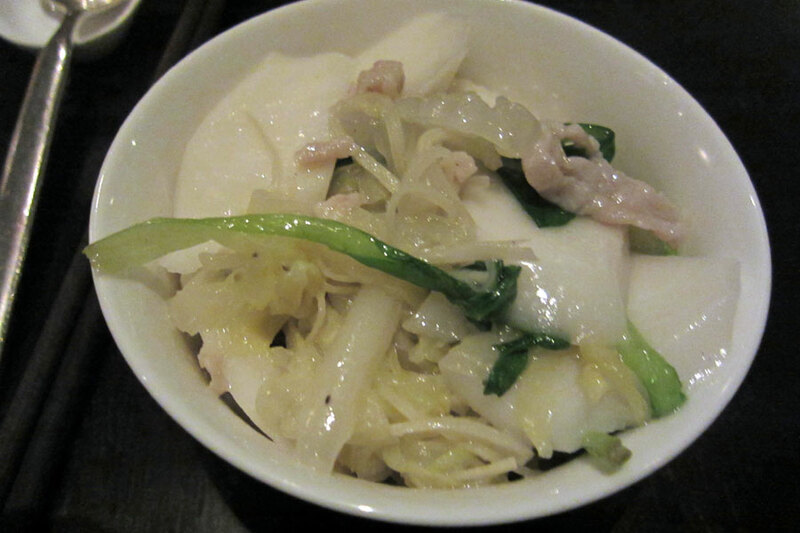 On the whole, the dishes here were not cheap, and the enjoyment I got out from this premium in price was minimal. Maybe the place was just a media hype (and a place for spotting celebrities and famous Hong Kong socialites), or maybe the place was still trying to find a firm footing in their style. We’ll have to see…. 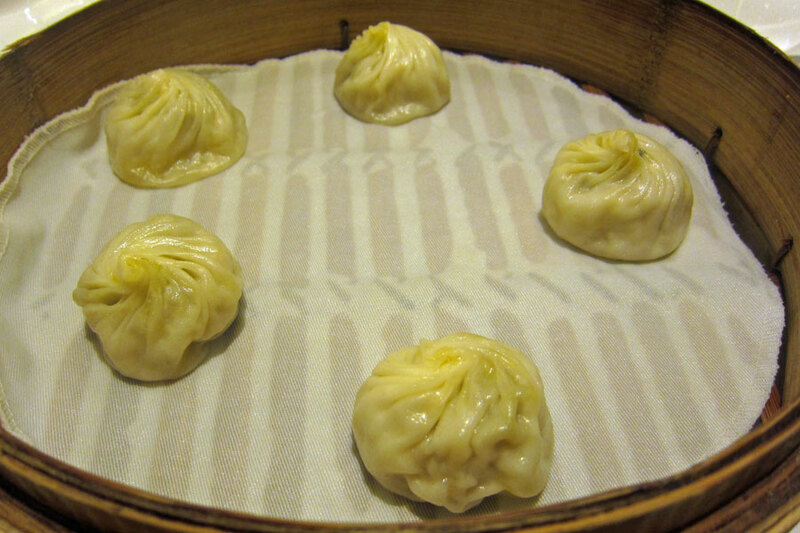 Billed as the cheapest Michelin-starred restaurant in the world, Tim Ho Wan is one of those places you just have to try to see what the fuss is about. 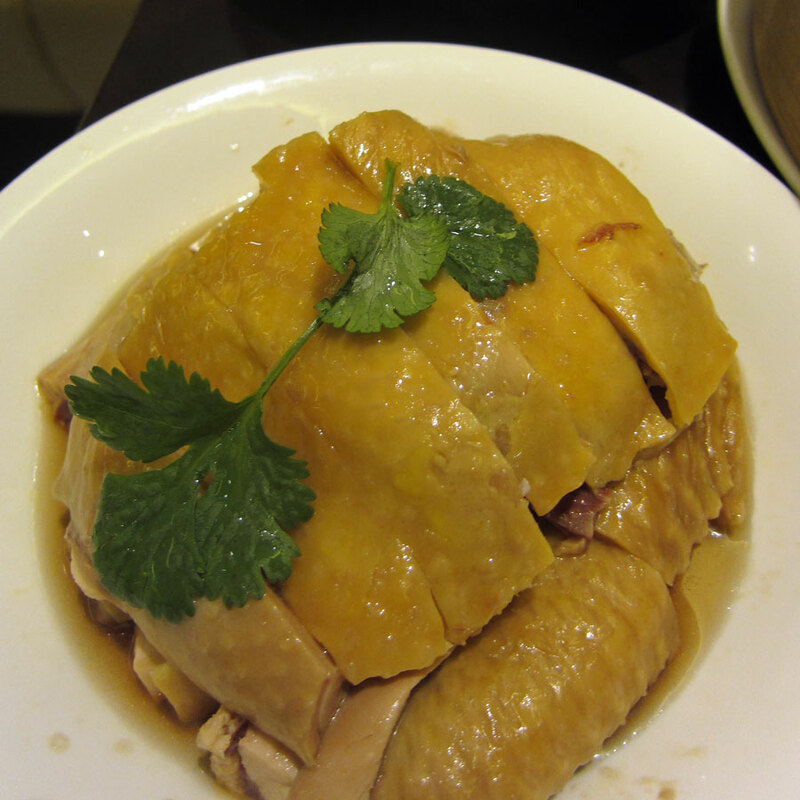 So on a business trip to Hong Kong in January 2010, I simple had to go there and see for myself. I went there first on a Friday at 3pm, thinking naively that it would be well after the lunch break but before everyone finishes work or school, so there shouldn’t be much of a queue – how wrong was I!!!! So I decided to return the next morning instead. Saturday would always be a risky day to visit this place, knowing that many locals would be making the same trip. I had all the good intention to get there by 9.30am, half an hour before the restaurant opened. But I overslept and only just managed to get there at 10am. There was already a long queue all the way to the end of the street. 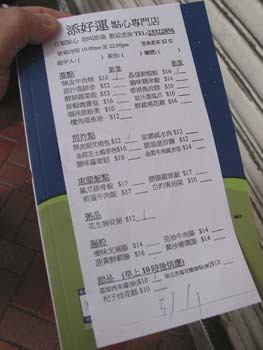 As the restaurant can only hold 20 customers at a time, a member of staff strolled down the queue to give out numbers and jot down the number of people in each group. The couple in front of me, numbered 30, was told that they would have to wait for at a very minimum of 1 hour and they should go for a walk in the neighbourhood and return in an hour. I was the only person in my group no. 31, and I was told that I should stay in the queue in case I could join another table and jump the queue. 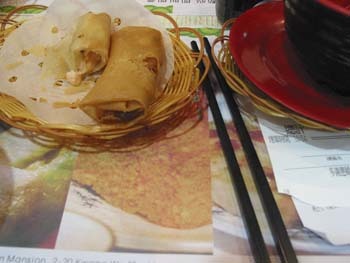 I was handed over a piece of paper with all the dim sum dishes, and I marked a few dishes that I fancied trying. As people got their numbers, many disappeared off for a walk round while more people arrived, so the queue hasn’t got any longer. However, by about 10.15, the number had already got up to about 54 (it was a group of young lads from Australia), and by 10.45, the number shot to seventy-something. Number 1 was called at about 10.50, and then there’s a rush up to no. 7 by about 11.00. Then a few minutes after that my number was called (Thanks to the lady with ticket no. 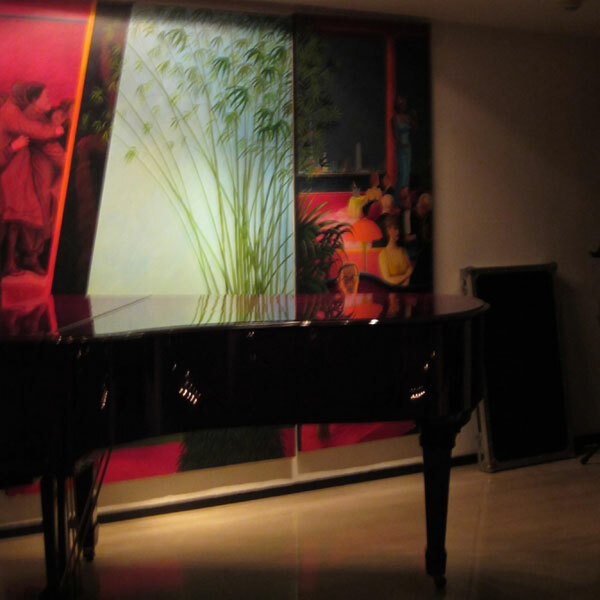 34 – she was right by the door and heard my number being called) and I was ushered to a table and joined a family of 3. 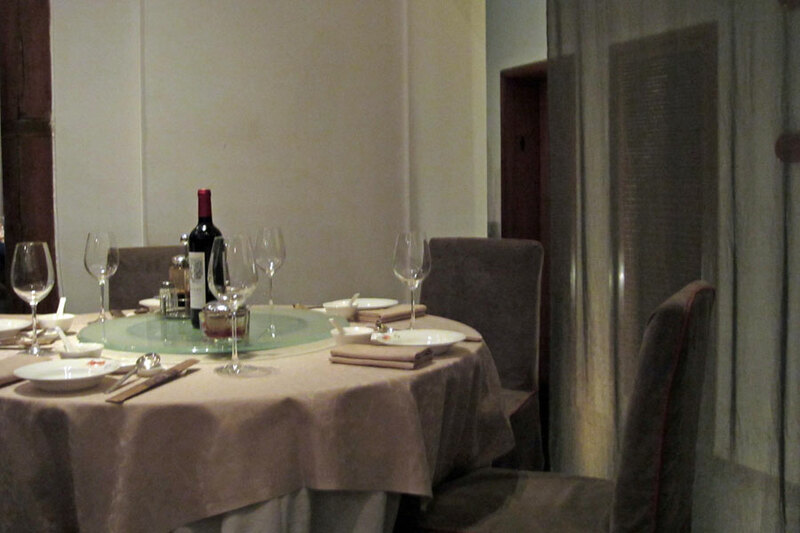 The restaurant itself was tiny – it could only seat about 20 people in total at any one time. At last minute I decided to add one more dish to my already rather greedy choice of 5 dishes, but I thought it’s worth pigging out just for the energy I used up queueing for an hour. 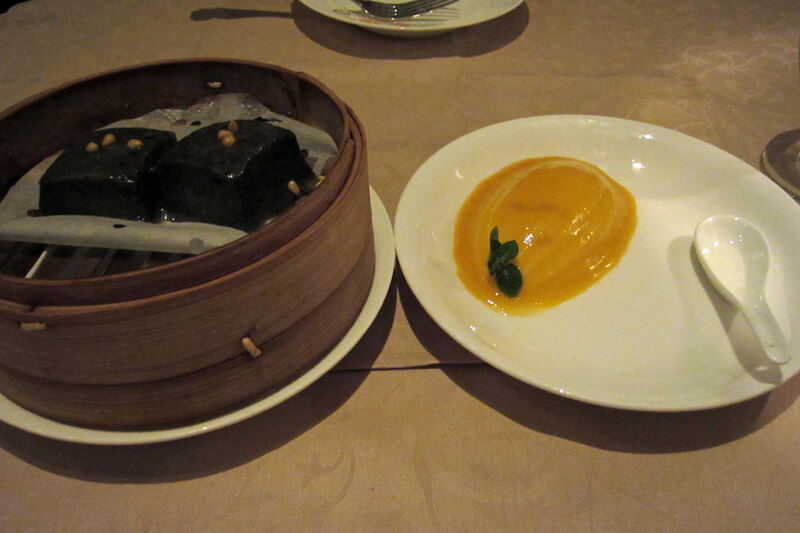 My first dim sum dish of the peanut and pork ribs congee arrived pretty quickly. 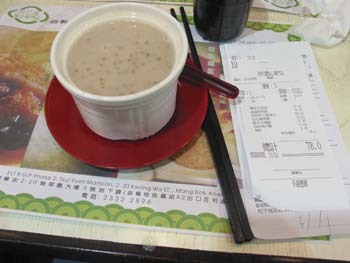 The congee had just the right consistency – not thick as a paste, and not watery either. It was beautifully seasoned and the pork just peeled off from the bone easily. It was a promising start. 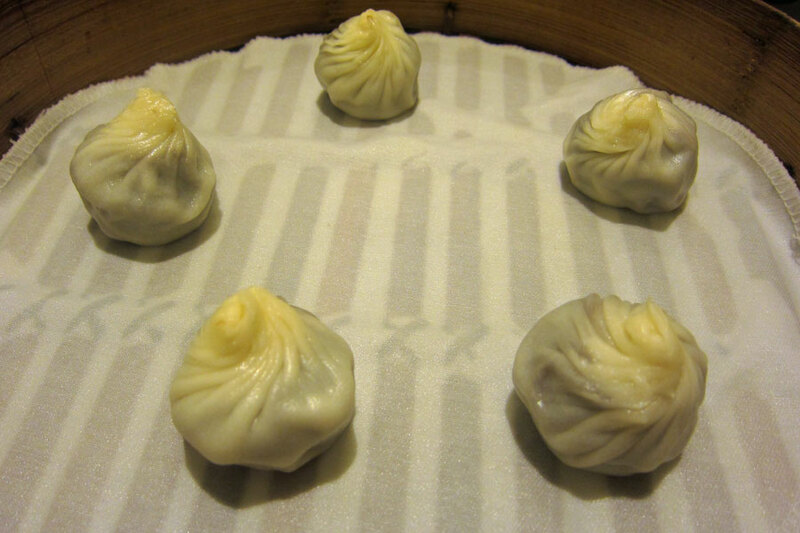 The next 2 dishes came more or less at the same time – the har gau (steamed prawn dumplings) and the main attraction of the restaurant, namely the baked char siu bao (roast pork buns). 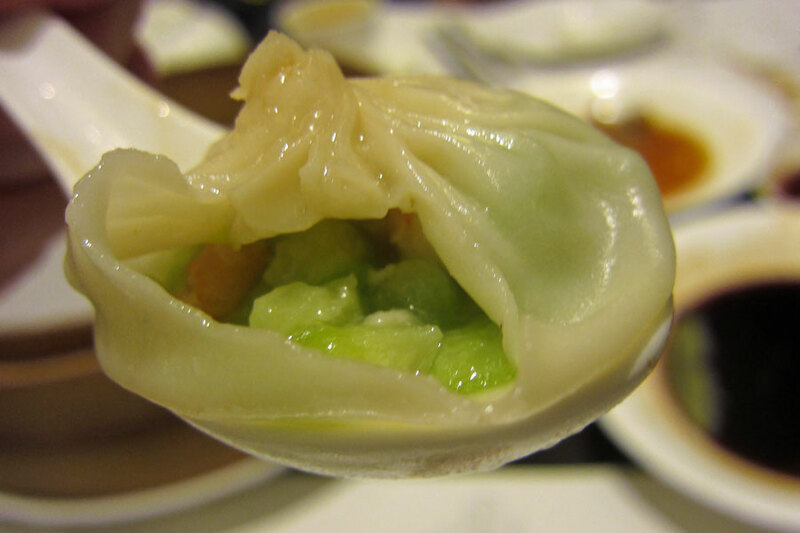 The dumplings were bursting with large succulent prawns, and were perfectly cooked. 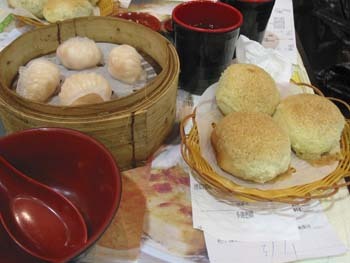 The buns were a real winner and did not disappoint – it’s one of the most famous dim sum dishes from this restaurant, and the twist of having a sweet baked topping instead of just the plain old steamed buns works magic – the sweetness of the topping blended in so nicely with the roast pork. While I was happily and greedily scoffing down all the food, the staff were busy taking orders, delivering freshly made dim sums to the customers, topping up tea (a choice of pu ‘erh or shou mei) and collecting money. 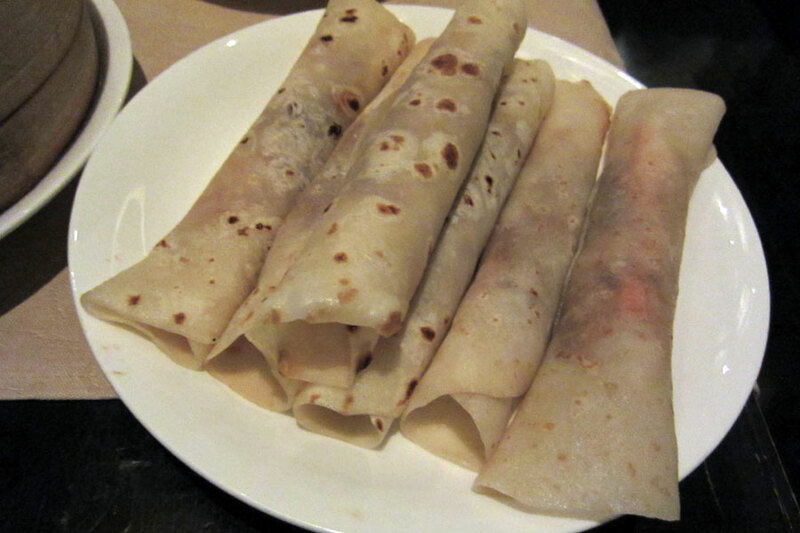 Spring rolls were next – the filling was garlic, cheese and prawn. An interesting combination but I didn’t think it worked well – the garlic and cheese were just too overpowering. 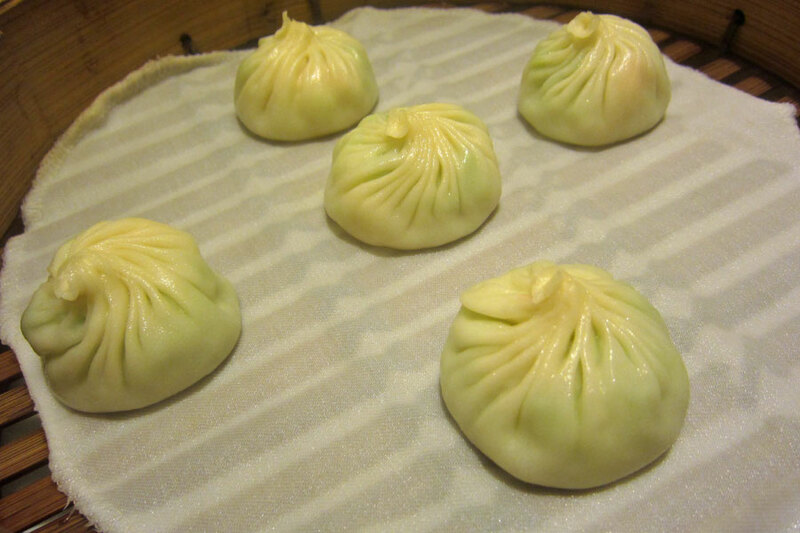 When I finished the first four dishes, it was a rather long wait for the fifth dish – steamed beef balls with orange peel. 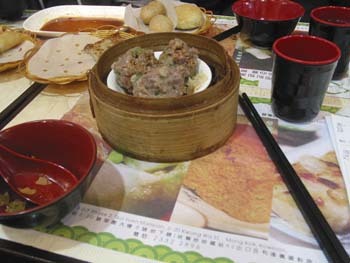 By this time I was rather full and so I didn’t enjoy the beef balls as much – while it was soft and tender, the texture was actually a bit too soft for my liking…. 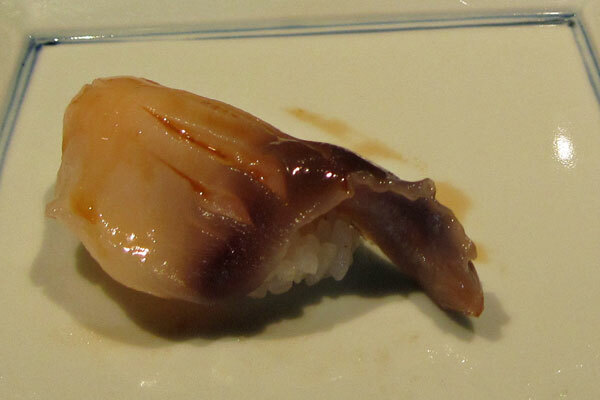 it was like eating a ball of fat though it was not that greasy. And although I was no longer hungry, I managed to finish the whole dish and once again I was patiently waiting for my last dish, feeling slightly embarassed that I was sitting there with no food in front of me while there was still a large group of customers gathering outside the door waiting for their lucky numbers to be called out and watching everyone in the restaurant eating. While I was still waiting, the family of 3 got their final order and they put the food into polystyrene boxes that the staff provided. 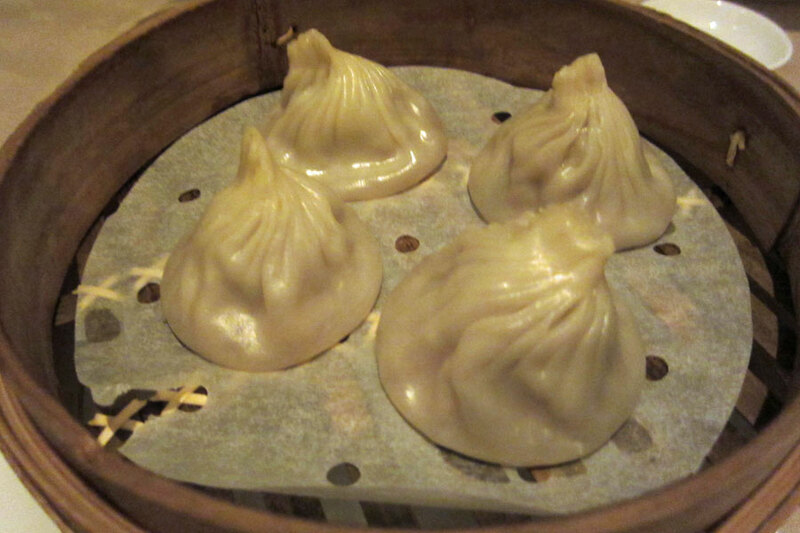 This was the family’s fifth visit to the restaurant, and they recommended the roast pork buns as well as the Chiu Chow dumplings and Turnip cakes. 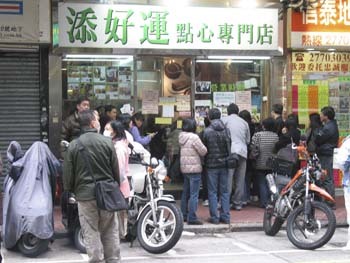 They said that some people started queueing at 8am – so that’s a good 2 hours before the opening time, and that most people with numbers beyond 100 would usually have to wait until late afternoon or early evening before they could even comtemplate of eating here, and number 200 onwards would basically have no chance of eating there. They then left the restaurant at noon and I was then joined by a couple – they were no.18 in the queue! 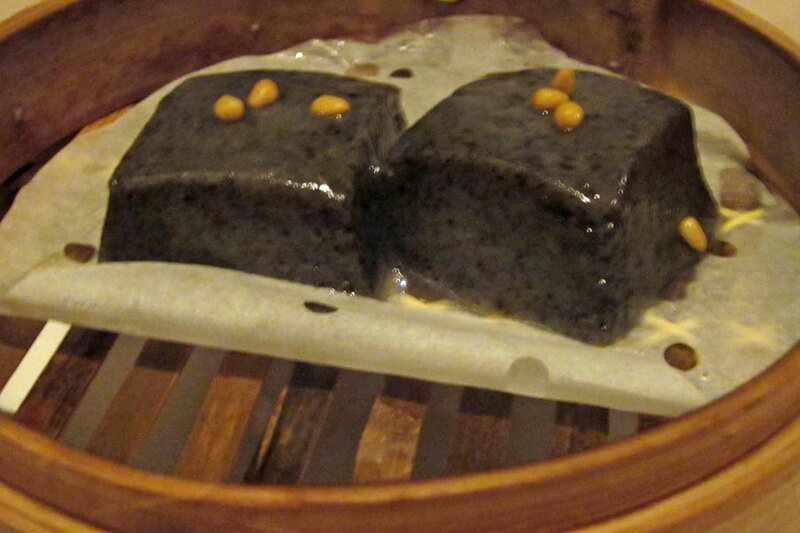 Finally after about 10 minutes wait, my final dish arrived – it was sago pudding with taro. 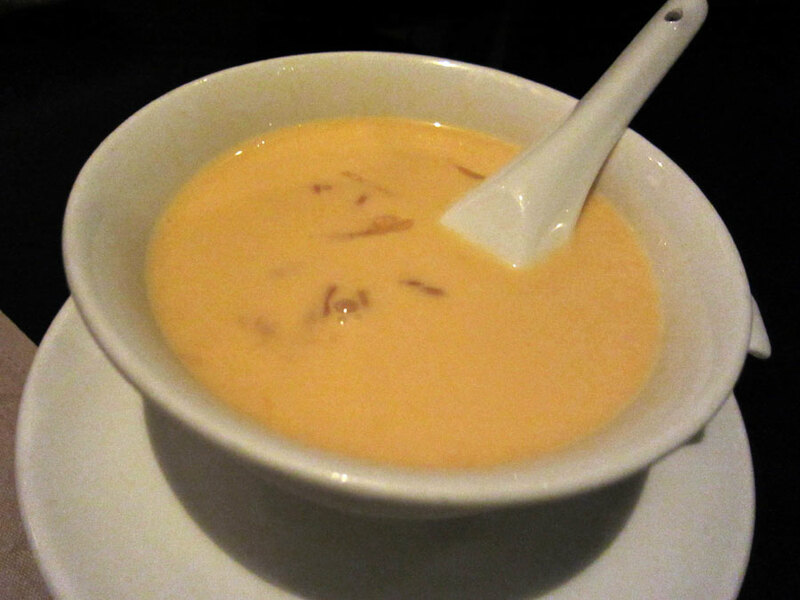 That was well worth the wait – the sago pudding was perfectly cooked, and the taro paste was smoothly blended into the soup base. 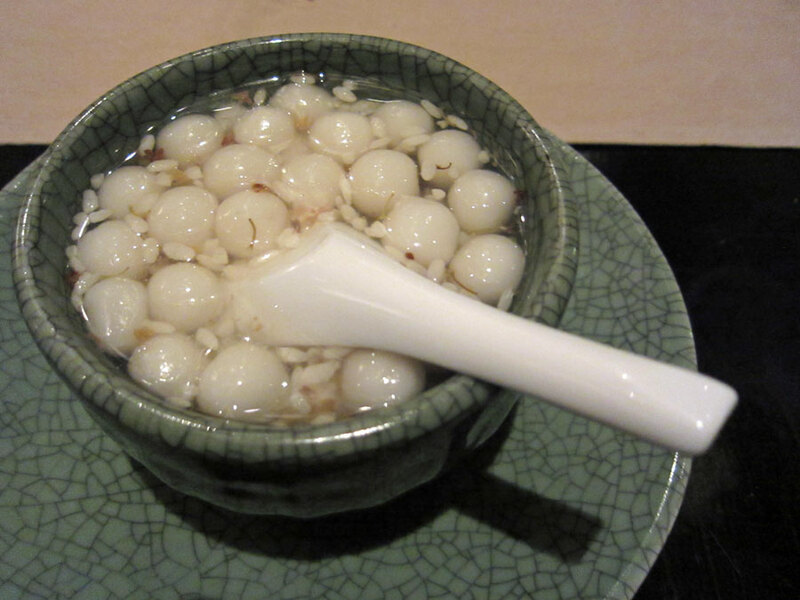 Once I finished the sago pudding, I promptly paid. 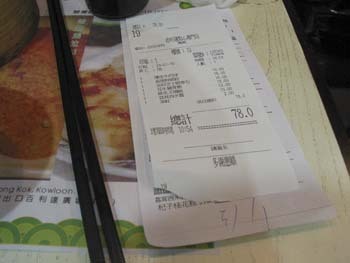 Six dishes came to a grand total of HKD 78, which works out to HKD13 per dish ie less than USD2 or just over GBP1 per dish. When I walked out of the restaurant, there was still many people gathering outside the door, including Mrs No. 34. I gave her instant feedback on what I thought of the dishes I had, wished her good luck and I departed. So was it worth a visit? I am two-minded about this. 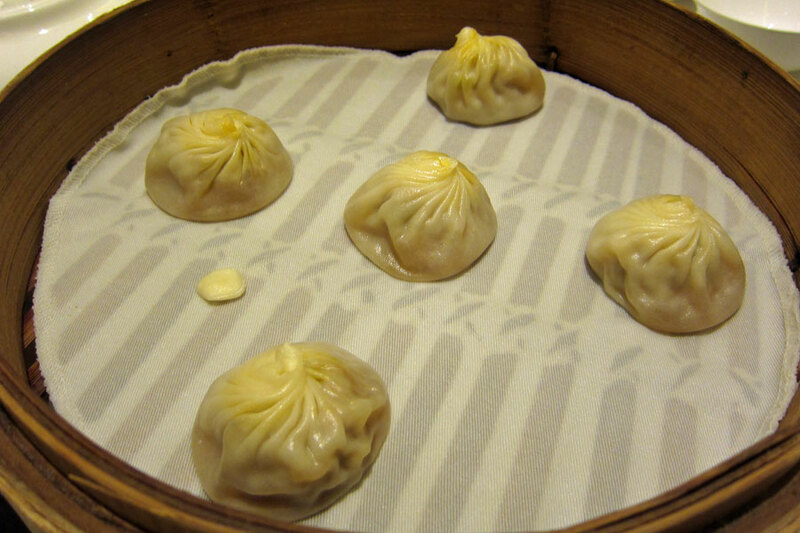 It’s certainly unusual to find a Michelin-starred restaurant so cheap, the quality was very good for this rock-bottom price, and the baked roast pork buns were to die for. 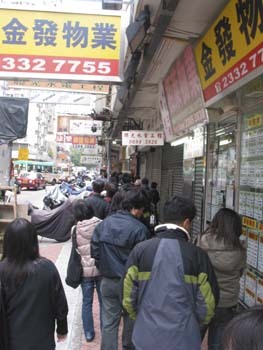 However, having to queue for so long (my legs were aching for the rest of the day) and the rather cramped uncomfortable seating, you’d be better off paying a little more, save the time to do other things and eat elsewhere, unless you are prepared to stand for a few hours first thing in the morning to guarantee a seat before lunchtime. 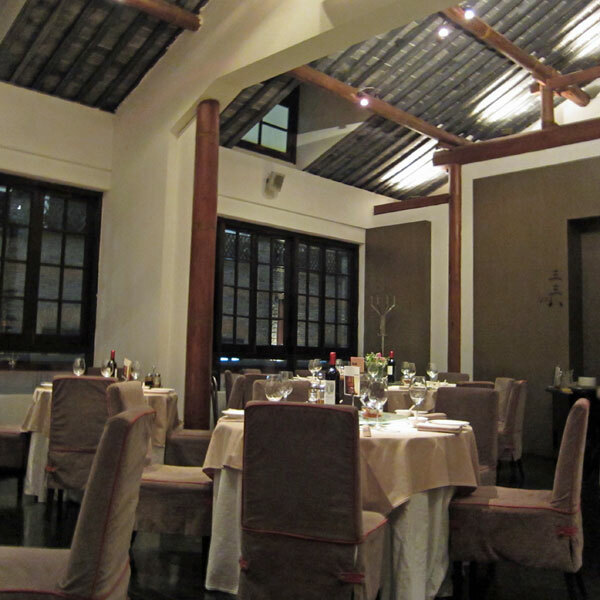 Rumour has it that the restaurant will move to a bigger venue after Chinese New Year – it remains to be seen if the expanded restaurant would be able to keep up with this quality. 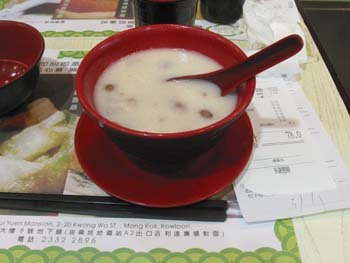 Address: 2-8 Kwong Wah St., Mong Kok, Kowloon, Hong Kong.